I had lunch not long ago with lovely Linda Vida, librarian extraordinaire. We chatted over butter lettuce and rocky cherry tomatoes in a downtown Sacramento hotel. We cut through chicken breasts hard enough for hockey pucks and talked about water: the lack of it, the shape of it, the blessed source of it in California. As the director of the Water Resources Center Archives of the University of California, Linda’s a good one to consult on all subjects relating to wet. 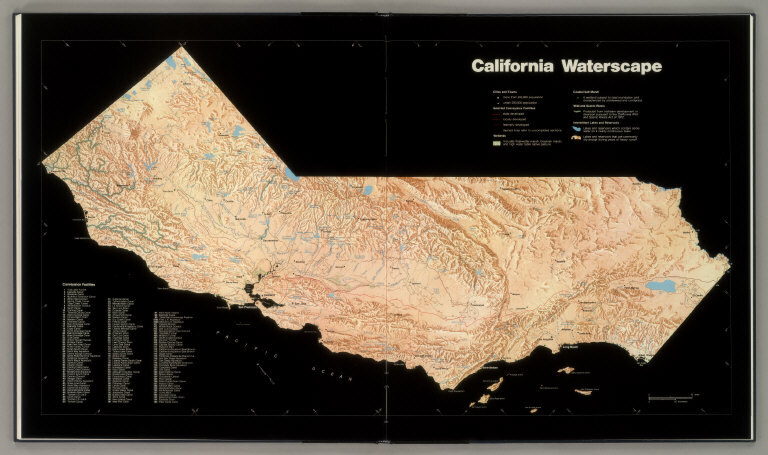 She was excited, in her low-key librarian way, about a newly completed project—the digitizing of the California Water Atlas, a monument of 20th century cartographic publishing, she said, originally produced in 1979 and no longer widely available. Now it has been scanned and put online for free public access by the David Rumsey Map Collection. The copyright holder, the California Governor’s Office of Planning and Research, agreed to allow free public access to the online atlas. The book was digitized at very high resolution so the resulting images can be explored, and analyzed in amazing detail. There are a huge number of diagrams, maps and illustrations that accompany the extensive text. The original work was a collaborative effort involving many people in and outside the government of then Governor Jerry Brown, including my friend and once editor Bill Kahrl, who served as project director and editor and who knows everything about the ways of California water. Although a monument to California’s water history, someplace between 1979 and now, the original art work for the atlas was destroyed. The book of maps had become a collector’s item, a few copies held in libraries and private hands. Today, thanks to Linda and David, who is president of Cartography Associates, a digital publishing company based in San Francisco, and a director of Luna Imaging, which provides enterprise software for online image collections, all you have to do to learn the lay of the land and the flow of the water in California, is go online and click. His collection, with more than 150,000 maps, is one of the largest private map collections in the United States. The online address is: http://www.davidrumsey.com. The atlas may be viewed in three formats online: in the LUNA Browser of the David Rumsey online collection, in a Flip Book Reader at the Internet Archive, and in three PDF files, low (46MB), medium (72(MB), and high (180MB) resolution. All files can also be downloaded from the Internet Archive site. When viewing the atlas online, David says it’s best to use as big a screen as possible because the original book is large, about three feet wide in the bound copy. Use of the digital files is free for all personal, non-commercial uses. When I heard about this newly available information resource, I got so excited I stabbed my breast and it took off like a slap shot for the goal, about hit the waiter in the knee. Linda, ever gracious, acted like she didn’t notice the faux pas and praised the dessert, Black Forest torte. She, of course, was right. It was good. White water photo courtesy of Mother Lode River Center, visit them online the next time you want to see California wet and wild, up close and personal, at: http://www.malode.com. 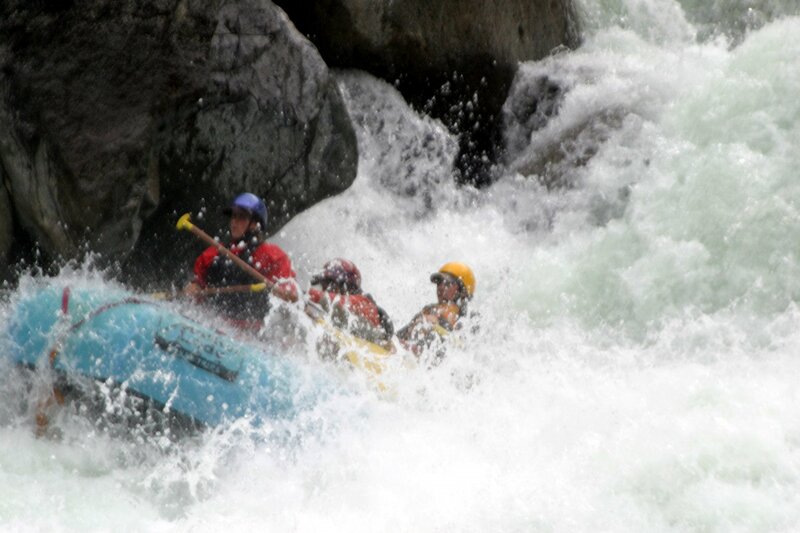 Late spring, early summer is the best time for rafting chills and spills on the state’s spectacular rivers. It might be a good idea to consult a water atlas before you go. you should have more of your photography here. maybe link to a flickr account? i need more pix! Thanks for the comment, Justin. Standby for more photos. Now that it's spring, I'll be out and about with my camera. Don't want to give anything away, but there are some interesting and beautiful destinations in my travel plans. Stop by my garden in coming weeks!